In the two years since her older sister Nina disappeared, Ellie Wrigley has been plagued with unanswered questions: why would Nina leave? Where is she now? Is she even alive? Everyone has given up on Nina, but Ellie can't let go. So when she finds a drawing, obviously done by Nina, in a thrift store, she commences a crazy, quirky cross-country journey in pursuit of Nina, following the clues she left behind with a most amazing guy she barely knows. But as Ellie gets closer and closer to Nina, she'll find that the truth about her vanishing may be more astonishing than she ever imagined. Lynn Weingarten has written a delightful, witty, zany, and heartfelt novel. Ellie is a very grounded and authentic character, and her pain at her sister's disappearance is very tangible. The book is peppered with clever clues that aren't too obvious and the book flows easily, bouncing around from one clue to the next, though it never feels like the story revolves around just those clues. Ellie's journey is about much more than just finding her sister: it's about love and grief and relationships and growing up as well. The mystery is solid and well devised and will keep you guessing up until the end, when a shocking twist is revealed that will make you want to reread the book to reexamine the clues and character motivations from an entirely new angle. Weingarten has a catchy, unforgettable style that varies easily from insightful and serious to wacky and hilarious and will make you laugh and think at the same time. 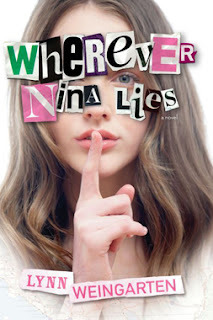 Wherever Nina Lies is an entertaining and wonderfully written novel that will have you hooked right away. Cover Comments: I love the style of the cover with the road map as a background, and the letter cut outs that make up the title. I think it's a really cool look and fits the mystery in the book well. I am not fond of the model on the cover though. She looks nothing like Ellie, and I don't really like how she's posed with her finger over her mouth, but this is a really good cover nonetheless! Excellent review. I hadn't heard of this one, but I'm adding it to my TBR. I was wondering what this book was all about! thanks for the review! Wow, this book looks amazing! I can't believe I've never heard of it.